Hello everyone, My family and I are very proud to be here at Bonanza. I don't think its the site, I think its the people and I'll be here as long as Bonanza remembers that. I have met some really nice people here and look forward to meeting many more. The Items I'm selling are from all the years of collecting things and Items my children no longer use. My family like so many others have fallen on tough times. I encourage anyone who is interested in any of our items to make an offer as we all know money does not grow on trees. A lot of the items I sell are not brand new but for the used things I describe as much as possible (even the Flaws). I also take as many pictures as possible so that my buyers know exactly what they are getting. 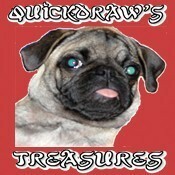 Hoping for many years selling and buying on bonanza and looking forward to meeting more great people. quickdraw doesn't have any items in their booth! what an awesome seller…..first class all the way. Thanks for NOV birthday PR0MO wishes> Anyone dropping POSiTiVE energy my waY = definitely deserves my individual PERS0NAL eND0RSEMENT ~ Please take a moment to visit membersâ€™ ( quickdraw ) b00tH nextâ€¦MONTR0Se approves this message!